Like a personal guided meditation, this pulsating lamp helps you fall asleep quickly and soundly—and there’s solid science behind it. Match your inhales and exhales to the pulses, and your body will take over from there. By slowing down your breaths to six per minute, Dodow gradually steadies your pulse. It stimulates the part of your brain that’s in charge of lowering your blood pressure and heart rate. The result is that you take longer exhales, release more CO2, your brain’s blood vessels shrink, and you’ll fall asleep two times faster than you usually do. Maker Alexandre Dujoncquoy cured his insomnia through concentrated breathing. He then teamed up with two product designers to make this technique almost foolproof. 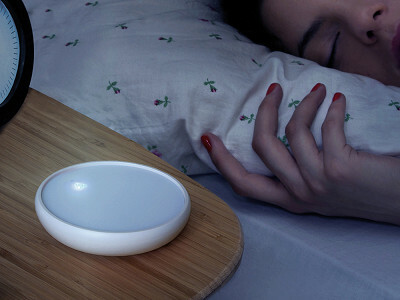 Now Dodow lulls over 60,000 people to sleep every night. To join them, all you need to do is breathe. Hello everyone! I'm proud to introduce Dodow to The Grommet. I'd be happy to answer any questions you have! I normally don't have problems going to sleep - I have trouble staying asleep - wake every hour or so. 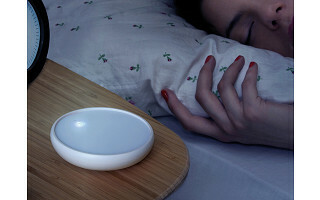 Will the clock also help you stay asleep? @Jocelyn Hey there ! Getting to sleep more relaxed is obviously going to increase your sleep quality but we cannot guarantee that it will keep you asleep. On the other hand it can help you get back to sleep ! I have a lot of difficulty shutting off my brain. I love your concept, but how does a light help when I have my eyes shut? @Linda I love to know this also. It makes no sound? @Kay @Linda It is like a sleep warm up ;) The objective is not to make you feel asleep during the 8 min exercise but to help your brain and body go in the resting state. Slow breathing helps relax the body and focusing on the variations of the lights helps shut off your brain ! I am wondering the same thing Linda is, how does the light help me shut off my brain? I always like my bedroom pitch black when I'm sleeping. But I do have trouble going to sleep. What color is the light. If its blue its the worse kind you can have when trying to go sleep. 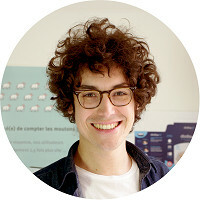 In the event it did not work for an individual, can it be returned? Hi Len, yes it can. You can find our complete return policy here. Must you keep your hand on the Dodow to regulate your breathing or do you have to look at the light on the ceiling to do so? I would love to see a video of it in action. Thanks very much! @Rosemary No you just tap the touchpad to turn the product on. Then the only thing you have to do is breath with the light ! The product turns itself off after 8 (or 20 if you wish) minutes. 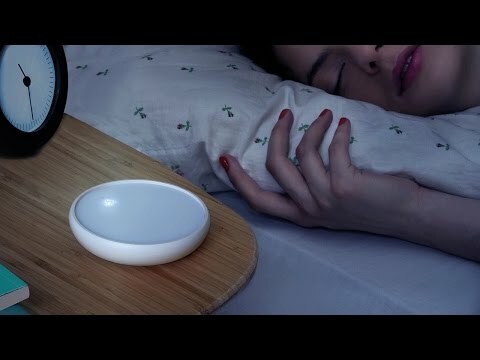 Alexandre how would this work with a sleep apena machines? It seems to glow with a blue light which is a pity as blue is what wakes us up. Would you consider creating it with a peach glow? Like a personal guided meditation, this pulsating lamp helps you fall asleep quickly and soundly—and there’s solid science behind it. Match your inhales and exhales to the pulses, and your body will take over from there. By slowing down your breaths to six per minute, Dodow gradually steadies your pulse. It stimulates the part of your brain that’s in charge of lowering your blood pressure and heart rate. The result is that you take longer exhales, release more CO2, your brain’s blood vessels shrink, and you’ll fall asleep two times faster than you usually do.